Those of you who are movie buffs probably notice that there is a certain timing to the film industry: the high-concept, deeply thought-provoking epics tend to come out around awards season so they’re fresh in the voters’ minds. Family-friendly, lighthearted comedies tend to come out towards the holiday season, and the big-budget, overblown, popcorn action flicks tend to come out…well, right about now, in the summer, and in the spirit of the imminent deluge of suspended disbelief, overly elaborate fight scenes, and credibility-killing impossi-spots, today we review a game that can best be compared to your average summer action movie. 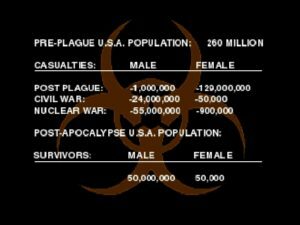 See how apocalyptic the apocalypse is?!?! 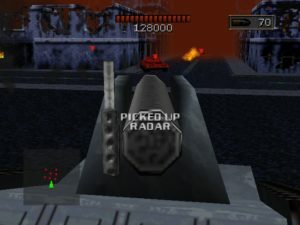 And die they will, as you have a nice arsenal at hand, ranging from laser beams to grenades to gun buddies (mini turrets you can lay at your base to add an extra measure of defensive firepower) to the good ol’ reliable nuke, which decimates the landscape and any tanks pretty much anywhere on the level (including your own, bear in mind). 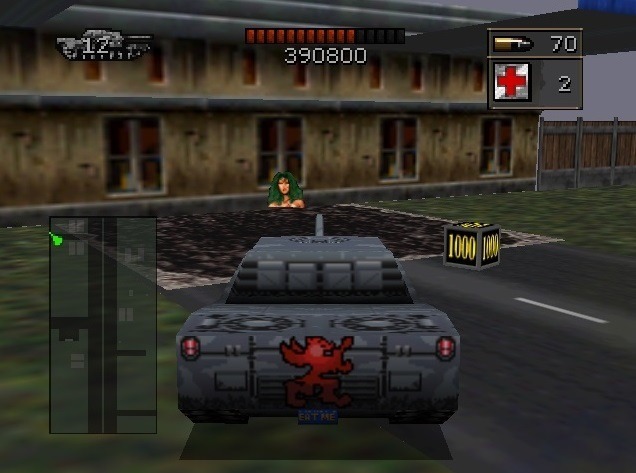 Controls are arcade-simple, a button to fire your main gun, a button for firing special weapons, buttons to move your turret independently of the rest of the tank (there’s also an option to lock your turret in place in case that’s too many buttons), and really meets the definition of pick-up-and-play. 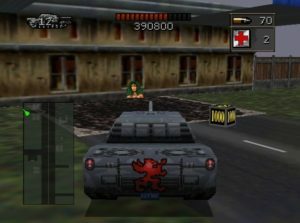 Now, one of the key factors in any good action flick are the special effects, or, in an equivalent video game, the graphics and sound…aesthetically, BattleTanx is not exactly a work of art…everything looks passable, meaning you’ll have no particular problems distinguishing an enemy tank from your allies, or an M1 from a Goliath, but buildings that can’t be knocked down look pretty similar to their collapsible counterparts, and tank sprites REALLY look warped once they’ve suffered serious damage, to the point they look like a plastic toy that’s been melted with a magnifying glass. 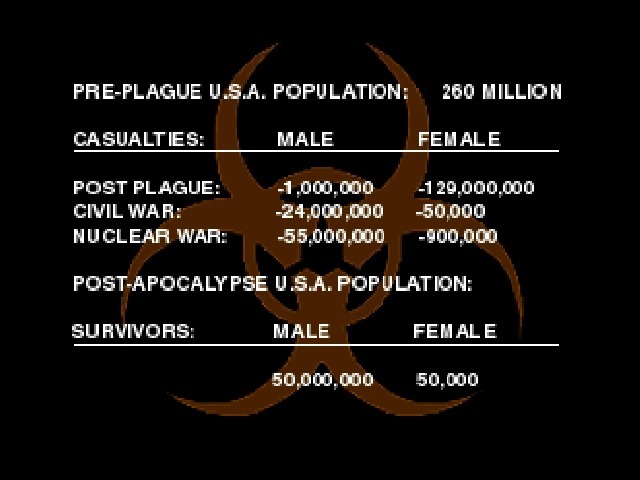 Even lazier is that Queenlords, the female survivors of the plague and nuclear war, and according to the story, the most important asset in the entire world, are portrayed with a 2-D headshot of some generic looking woman. Anticlimactic. But the worst problem with the graphics is, unquestionably, the fog. DEAR CHRIST THE FOG. Apparently someone at 3DO wanted to give those of us who didn’t live in the San Francisco area a taste of the local weather there, because this game is draped in a blanket of fog and smoke effects that would give Industrial-era London a rager. I can almost forgive the fog given the apocalyptic setting, and maybe if you could use the reduced visibility to your advantage, but that is not the case. Enemies can and will punch holes in you with no qualms while you roll forward in hopes of even seeing WHAT’S attacking you. Not being able to see more than a block ahead of you when a lot of levels consist of cityscapes is a really unwanted handicap. Behold! The salvation of humanity! This cardboard bust of a woman! All in all, BattleTanx isn’t a bad game by any stretch, but as I mentioned, it can be a bit repetitive at times, and isn’t exactly the deepest game out there. It’s stupid, mindless fun that anyone can get jump into and be competitive in, and if you wanted to rent a game for a weekend to run through, or have some drunken deathmatch fun with some buddies, you could do worse than this…to complete my analogy to the standard summer action movie, when it comes to BattleTanx, you plunk down your money, you get a few hours of enjoyment, and then you move on…but you had your fun, and that’s what matters. Simple fun that makes for an fast-paced, fairly enjoyable action romp. Always satisfying to drive a tank and smash up Las Vegas. Gets repetitive, not very much variety in mission types or tanks, OH MY GOD THE FOG! 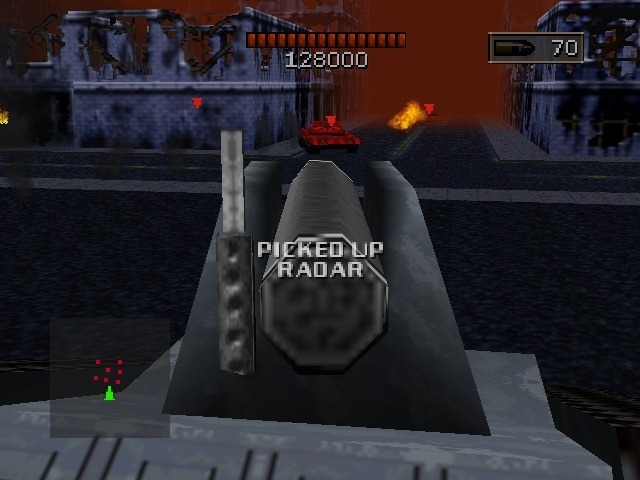 Oh god, the fog was so bad that I had to use the Cruise Missile as a sort-of UAV to find the opposing tanks.